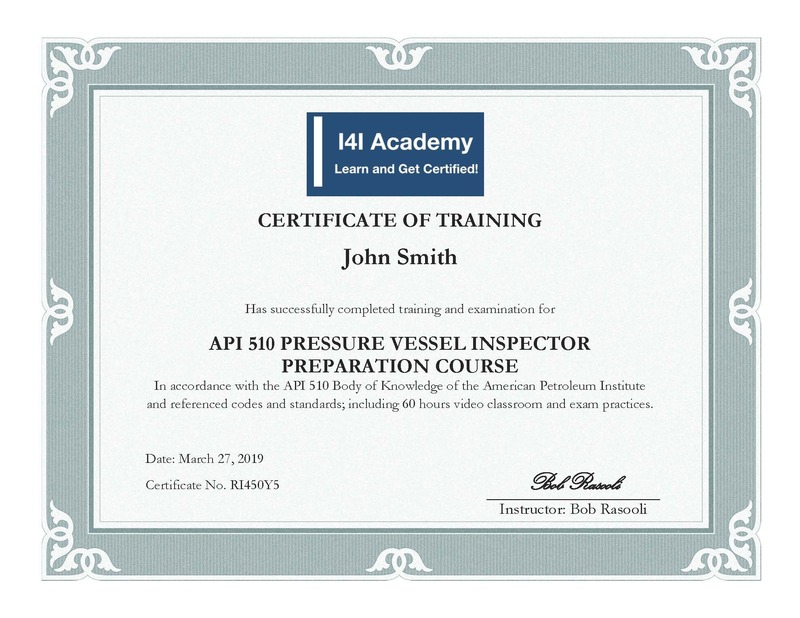 I4I Academy provides API 510 training course (API 510 Pressure Vessel Inspector) - Online Video Training - for Exam Preparation and is 60 Hours (7.5 days) course and available online all over the world. When you completed the video training sessions for each segment which cumulatively is 21 hours, in the next step, you will be connected to the practice exam portal with the thousand (1000) of practice exam questions; you need to complete them. You are going to take a final exam at the end of the practice exam questions (50 questions open book and 100 questions close book similar to API 510 exam) and receive a certificate from I4I Academy with my signature. This API 510 training course with video training session and practice exam questions will prepare you to take API 510 Pressure Vessel Inspector exam and pass the exam. However, if you think you do not need video training/handout and only need practice exam questions, you may purchase only API 510 Practice Test and Exam Questions Package. Highly recommend getting the full package (API 510 Training) since you might struggle with ASME Section VIII Div.1 and IX questions. API STD 510 - Pressure Vessel Inspection Code: Maintenance Inspection, Rating, Repair, and Alteration - Entire Document but section 9 and appendix E excluded.